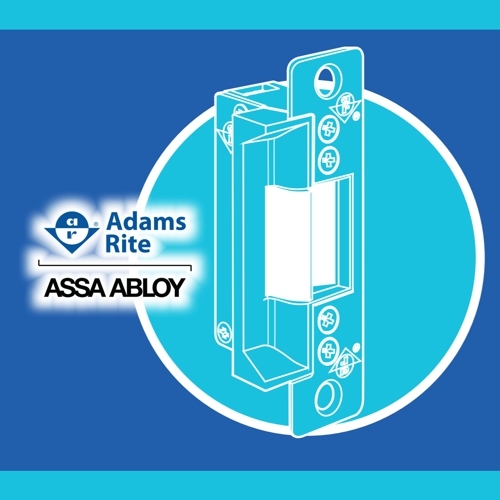 Adams Rite offers lock cylinders that are manufactured to close tolerance, carefully aligning setscrew grooves and cam allowing for proper mating with the lock or latch mechanism. These cylinders operate any Adams Rite lock or latch requiring a mortise cylinder. They are designed to accept standard mortise cylinders of all popular brands. Cylinders are available in keyed-alike pairs, keyed-different and keyed-alike sets of 50. All cylinders come with two keys per cylinder. The mortise cylinder trim ring is furnished with the cylinder and is 1/4” thick, which is suitable for 1-3/4” doors. Other door thickness can be accommodated by special order. A vandal-proof cylinder guard in hardened steel is available to prevent forced entry by removing the cylinder. Properly installed, it rotates around the cylinder and is held in place by a steel ring on the inside of the stile. Please note that all narrow stile doors require a cylinder guard to fill the gap remaining between the cylinder shoulder and style when a standard mortise cylinder is used. Please refer to the formulas provided by Adams Rite to determine the proper length of 1.71” I.D. tubing to meet this need.